it is a country where any visitor will be astonished since it has unimaginable attractions from the impressive Uyuni Salt Plains with its green and red lakes, through the exotic biodiversity of Madidi or the Pantanal Parks (among others), and ending in the Chapare (Cochabamba Tropics) or Amazonia. Add its important historic heritage to the paradisiac natural landscapes, which can be appreciated in the cities of Sucre and Potosí, the Jesuit missions and Tiwanaku (ruins of an important pre-Colombian culture). Bolivia is the perfect place for travelers who love nature, culture and adventure and who wish to enrich their lives through contact with an authentic culture. The Plurinational State of Bolivia is found in the heart of South America, bounded on the northeast with the Federal Republic of Brazil, the southeast with Paraguay, the south with the Republic of Argentina, the southwest with Chile and the northwest with Peru. It has an area of 1,098,581 km2, population of 10,125,522. The population density concentrated in the cities while extensive untouched areas still remain. 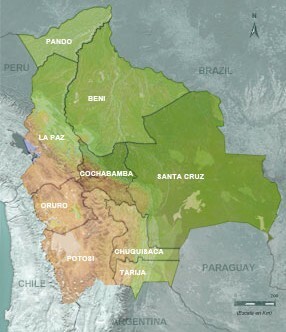 Bolivia is divided into 9 departments: La Paz, Oruro, Cochabamba, Santa Cruz, Potosí, Chuquisaca, Tarija, Beni and Pando. 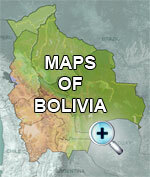 Bolivia became a republic on August 6, 1825. 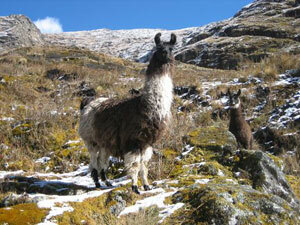 Its constitutional capital is Sucre (capital of the Department of Chuquisaca) and the seat of government in La Paz.